How to clear Safari history and cookies from iPhone iPad iPod in iOS 9/9.1/9.2/9.2.1? Read this guide to easily make it. Download PhoneClean to completely remove safari histories, cookies and junk files on iPhone iPad and iPod touch by following this tutorial. Safari saved search history, visited pages and some other browsing data are useful, when you want to go back and find your visited pages again. But sometimes it may not safe if you lose your iPhone because your Safari privacy browsing history or login password may leak out. So how to protect your privacy info and delete these items as you wish? Below are 3 methods that may be useful, and they also apply to recent released iOS 9.2/9.2.1. 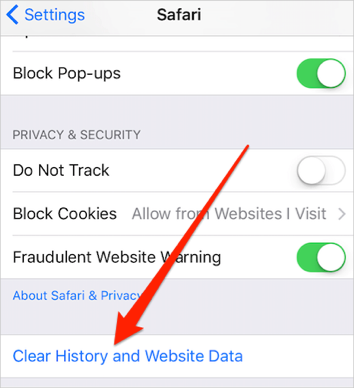 iOS 9/9.1/9.2 provides you the method to directly delete browsing history on your iPhone iPad Safari app. Just open your Safari app, click bookmark icon that looks like one opened book on the bottom of your screen, and then go to History option just like the screenshot shows as below. After that, you can swipe to delete any items you want to get rid of, and you can also remove all of them in 1-click. You may want to remove all of browsing history and saved data on Safari, no matter for freeing up space or clearing privacy data. In this case, you can go to Setting app and tap Safari. Just click “Clear History and Website Data”. Some professional software can be your best choice if you want to manage your iPhone history, cookies and junks in a flexible way. And PhoneClean is one of best tools in iOS cleaning. After downloading and installing PhoneClean to computer, now you can use its new feature - Internet Clean - to selectively delete Safari history, cookies and junk files as you wish. Below are some simple steps you can follow to use it to make it. Step 1. Run PhoneClean and connect your device to computer via USB cable. Step 2. 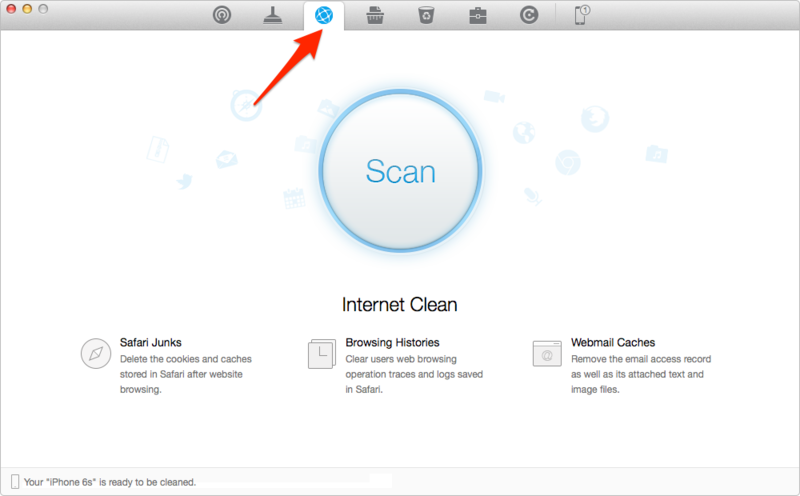 Select Internet Clean and click Start button to scan your Internet history, cookies and junks. 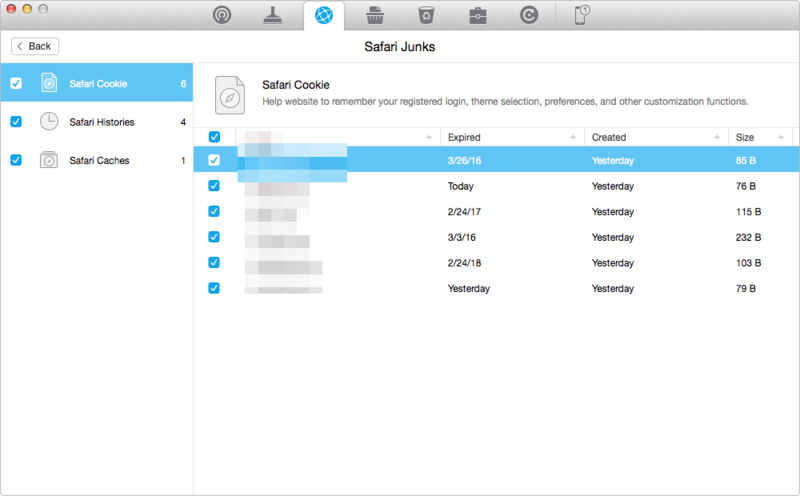 Step 3. Review details on Safari Junks, and select any history, cookies or caches to remove.